We love this Italian dish that bursts with summer flavours. It takes a while to prepare but the rich flavours are really rewarding and it is straightforward to prepare. You will need a big dish as this is a generous portion for 6 but it makes delicious lunchbox leftovers. Kids like it chopped up a bit and stirred through pasta too. Serve with a green salad and you will definitely need bread to help clean your plates. You can assemble the dish up to a day in advance and bake for 40 to 45 minutes when ready to serve. Wine Suggestion: this is a robust dish and needs an equally robust and fresh red wine to match. Our choice tonight was made by an old friend Laura, the Gianni Brunelli Rosso di Montalcino; fresh youthful and elegant and yet with a powerful backbone. Put the peppers onto a baking sheet and cook for 45 minutes or until the skins are soft and blackened in places. Trim the ends of the aubergines and slice them lengthways into 1cm thick slices. Put the aubergines in a colander and sprinkle generously with salt. Put a saucer on top and weight down with a tin of tomatoes (or something similar). Leave for about 20 minutes. Remove the roasted peppers from the oven and either put them into a bowl covered with cling film or into individual sealed sandwich bags to cool for 20 minutes or so. To make the sauce, peel and chop the onion and roughly chop the carrot and celery stick. Whizz these in a food processor until finely chopped. Crush the garlic on a board with some salt. Heat 1 tbsp of the oil in a large frying pan. Cook the carrot and celery mixture for a few minutes or until softened but not browned. Add the garlic and cook for another minute, then add the passata. Simmer the sauce for 10 minutes until thickened. Stir in the chopped herbs and basil leaves. Season to taste and set aside. Brush the aubergine slices with the rest of the oil and cook in batches on a griddle pan for 3 to 4 minutes on each side or until softened and browned (you can cook under a grill if you haven’t got a griddle pan). Lay all of the slices of prosciutto together on a board, then slice finely. Finely grate the parmesan and slice each mozzarella ball into 6. To assemble the dish begin by spreading a layer of sauce over the base of a large casserole dish or roasting tin. Layer half the aubergines, a third of the mozzarella and a third of the prosciutto on top. Follow this with another third of the mozzarella, a third of the grated Parmesan and prosciutto and another handful of basil leaves. Spoon over half of the remaining tomato sauce and top with all of the peppers. Layer over the rest of the mozzarella, prosciutto, aubergine and another third of the Parmesan. Finally spoon over the rest of the sauce and finish with the remaining Parmesan and a drizzle of oil. Bake for 30-35 minutes or until browned and bubbling. Remove from the oven and allow to sit for 5 minutes before serving. I think Jamie’s Italy might be our favourite Jamie book – it’s without a doubt the one we’ve cooked the most out of. This is a super way to use up aubergines which are bang in season at the moment. Jamie says this is a side dish but we served it as a main with some garlic bread and next time we’ll serve a green salad too. 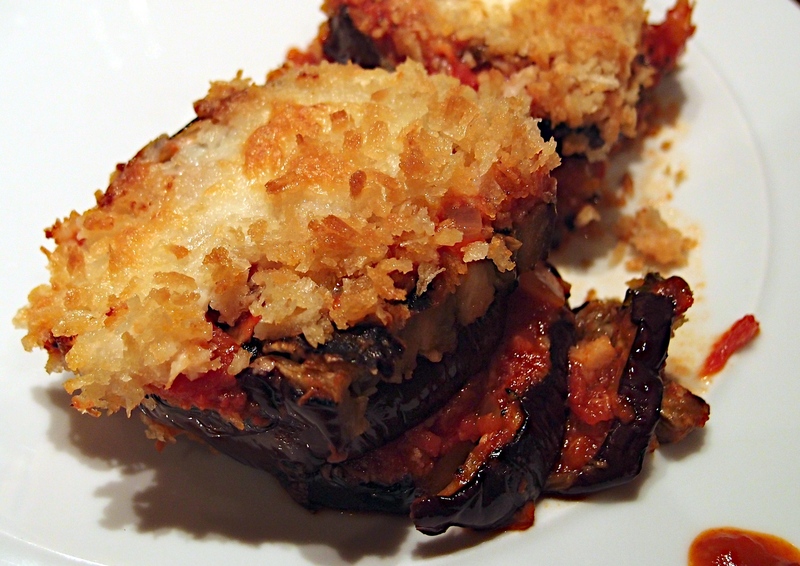 The revelation for us was to barbecue (or grill) the aubergines to avoid the oiliness you so often get with this dish. Slice the aubergine into 1cm thick slices and set aside. Get the barbecue (or griddle pan) really hot. Meanwhile put some olive oil into a large pan and put onto a medium heat. Add the onion, garlic and dried oregano and cook for 10 minutes, until the onion is soft and the garlic has started to colour. Break up the tomatoes and add to the onion, garlic and oregano. Give it all a stir and cover and simmer slowly for 15 minutes. Meanwhile, barbecue the aubergines until lightly charred, in batches. When the tomato sauce is reduced, season it carefully with salt, pepper and a tiny bit of wine vinegar, and add the basil. Put a small layer of tomato sauce is an earthenware dish, then a thin scattering of Parmesan, followed by a single layer of aubergines. Repeat until the ingredients are used, finishing with a little sauce and a good sprinkle of Parmesans. Tear the mozzarella over the top. Bake the dish at 190°C/375°F/gas 5 for half an hour until golden and bubbling. Wine suggestion: a great way to match food and wine is to look at where the food comes from … in this case Northern Italy so a nice Barbera d’Asti would work a treat.